We are restricted to 12 seats per boat. This is for groups who want the boat to themselves. 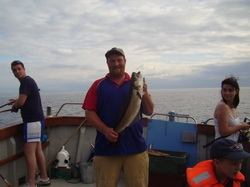 Angling max 8 and diving max 10 half day €350.00 8.30 am - 12.00 3.5 hours. For short angling trips, We do evenings 6 - 8.30 @ €30 per person. This is with Rods and Tackle included. This is very popular with families. For large groups a deposit of 25% of the charter fee secures the booking I will email a secure link to pay the deposit if required. The deposit is refundable if the weather is bad, or if we have to cancel the trip due to circumstances beyond our control, or if you cancel the booking but give us adequate notice, normally about 5 days. Any guests who are booked and don't contact us at least 24 hours before and don't show up will be charged a cancellation fee of 33% of the charter. All trips are weather dependent and in the interest of safety can be cut short or cancelled at short notice.